Late 2014 and we are in a space of reflection, the subject of which is everyday life in the African metropolis, that cultural 'elsewhere' which the discipline of art history usually shrouds in mystery and myth. 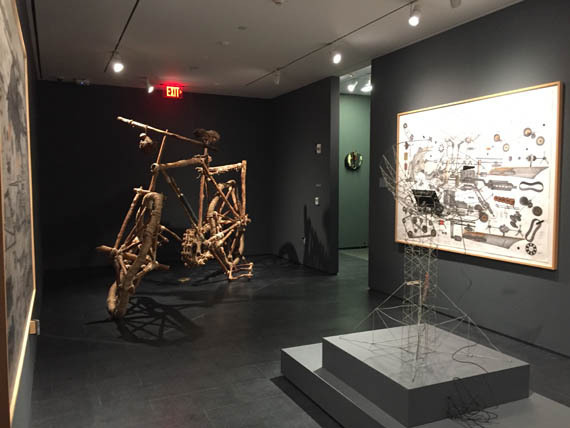 We see a giant bicycle, fashioned out of ropes and wood; a miniature kaleidoscopic city crafted from cardboard and paper and a series of intricate drawings, offering dystopian visions of a post-apocalyptic future sketched out in remarkable detail. And in various corners sit several examples of anthropomorphic sculptures, transforming waste and weapons into objects of art. What is missing, of course, is that enduring image of traditional African art: the tribal mask that long ago served as inspiration and the currency of cultural renewal for the twentieth century's European avant-garde. And what is singularly absent too is the continent's ubiquitous synecdoche so beloved by cultural tourists: exotic figures with elongated limbs, hand-carved or painted against orange sunsets, complete with wildlife, and luscious fauna. Luminós/C/ity.Ordinary Joy: From the Pigozzi Contemporary African Art Collection, the inaugural exhibition recently presented at Harvard University's new Ethelbert Cooper Gallery of African and African American Art at the Hutchins Center in Cambridge, Mass., offered a compelling and eclectic assemblage of different artistic approaches, loosely structured around the theme of the African city. 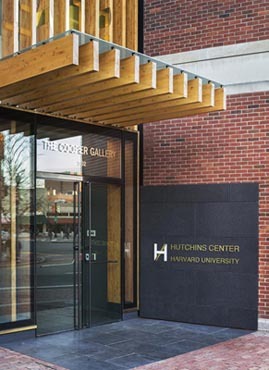 A much welcomed and highly anticipated addition to Harvard University's long established gallery and museum circuit, the gallery's self declared remit is to create a space - the first on any US campus - where, to paraphrase the Hutchins Center founding director Professor Henry Louis Gates Jr.: "the art and artists of the African Diaspora are at home and in constant movement, where voices are heard in both startling clarity and productive cacophony". Conceived by Professor Gates and designed by British Ghanaian architect David Adjaye, the Cooper Gallery opened its doors to critical acclaim in September last year, and the inaugural exhibition reflected this unique mission in interesting and surprising ways. While it provided a sense of place for a diverse body of artistic practices from the continent rarely seen in the US, it also spoke confidently to the conundrum of collecting and exhibiting African artworks, and to the critical question of how these works translate and resonate in environments far removed from their indigenous context. Complex questions without doubt, and guest curators David Adjaye and Mariane Ibrahim-Lenhardt - working in close collaboration with gallery director Vera Grant - have eloquently mastered the challenging task by choosing a fine and thought-provoking selection from a fascinating collection historically steeped in controversy. The 98 artworks by twenty-one artists were chosen from several thousand pieces assembled by Italian businessman and philanthropist Jean Pigozzi and associates for his private collection, The Contemporary African Art Collection (CAAC). Since its inception in the late 1980s the collection has been the subject of the most extraordinary set of claims and counter claims; not in small part due to its original, arguably somewhat limiting if not primitivist, collecting criteria: eligible artists had to be black, live and work on the continent and ideally 'untainted' by formal art education. So how does one then select respectfully, responsibly and strategically from such a vast repertoire of visual stimuli, all subject to the aforementioned claims? And in a way that does not appear reductive? How does one link art works by more than mere shared geographies and subvert stereotypes rather than confirming them, whilst preserving the 'quirk' and idiosyncracy of each? And how does one avoid the dangers of isolating artistic practice originating from one place on our planet from the wider discourse of art? One very remarkable and thought-provoking way of meeting this challenge of re-assembling the collection in a way that is meaningful to a new audience, was to invite David Adjaye - the architect tasked with transforming the former commercial space into an avant-garde gallery complex - to also curate the first exhibition. This is a radical and interesting proposition because it is one that opens up a unique dialogue between art and environment, via eight discrete curatorial spaces, painted in deep charcoal tones, of different heights and configurations. Intriguingly, Adjaye designed the exterior façade of the Cooper Gallery to represent a Kumasi forest, inviting passers-by to glimpse inside through its wooden beams and glass panels, enabling the inside to speak to the outside, and vice versa. 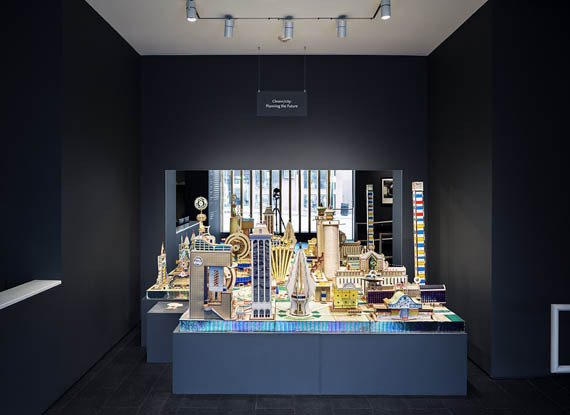 Considering the distinct architectural lens applied to this curatorial exercise, it is of no surprise that Luminós/C/ity.Ordinary Joy opened with an intricate architectural sculpture, the work of Congolese artist Bodys Isek Kingelez. Meticulously crafted, the artist's vision of a brilliant African city encapsulated the exhibition's premise beautifully: Kingelez' post-modernist buildings fabricated from cardboard and other found materials are fueled by the desire to create different, new and necessary worlds; to become active agents in the process of shaping the future - an aspiration shared by many of the artists and protagonists represented throughout the exhibition. Image: Bodys Isek Kingelez, Kimbembele Ihunga, 1994. Photo by Dean Kaufman. Utopian and fantastic at first glance, these miniature model cities also point towards another darker reality, namely the deeply problematic building projects frequently to be found throughout the African megalopolis: excesses of urban planning, fairytale monuments financed by World Bank loans impossible to repay or complete: shattered dreams of development manifest as half-finished ruins of modernity amidst chaos, corruption and post-colonial disillusionment. Image: Seydou Keïta, Untitled, 1949. Courtesy of CAAC. Yet it is precisely within these spaces of turmoil that the artists - and the curators - seek moments of 'ordinary joy'. This is brilliantly illustrated in the exhibition's numerous examples of aspirational street and studio photography: the 'dream-factories' where artists become 'merchants of illusion', transforming their clientele into modern citizens of the world, posed against elaborately painted backdrops that feature contemporary interiors, opulent furnishings and Manhattan skylines (courtesy of Ghanaian artist Philip Kwame Apagya). In the grand portraiture of Malian pioneers Seidou Keita and Malick Sidibé, or the joie de vivre documentary images captured by renowned Congolese photographer Jean Depara, we encounter in its most pristine, original form, beautiful people in hedonistic moments of self-fashioning, members of an emergent cosmopolitan class in the decades leading up to independence, and later in the post-colony. The art of recycling and assemblage emerges as another recurring leitmotif in the city: reclaiming discarded objects to transfigure Europe's waste into Africa's growth, conceptual artists Romuald Hazoumé, Calixte Dakpogan and Concalo Mabunda endow miscellaneous items of rubbish and discarded weapons with cubist-like human faces. Gasoline canisters with eyes made of mobile phones and mouths created from tinned fish cans eerily resemble traditional African masks, the quintessential signifier and product for consumption of Africa in the West. Collectively, they evoke centuries of European powers stripping the continent of its natural resources: canned sardines become synonymous of human cargo and the sinister horrors of contemporary migration and human trafficking, discarded mobile phones recall the ongoing and brutal mineral extraction in the Congo. Image: Installation view, showing the work of Chéri Samba, Gonçalo Mabunda (centre), and Kudzanai Chiurai. Photo by Renée Mussai. Playful, cynical and uncanny, these global junk artworks offer damning socio-political commentary on the legacies of cold-war politics, and a subtle critique of our capitalist, exploitative consumer cultures, as well as the market place associated with contemporary art practice. One of the exceptional charms of Luminós/C/ity.Ordinary Joy is its power to offer its audience different experiences and sensations as one moves from one exhibition chamber, alcove or corridor to the next, owing much to Adjaye's intuitive gallery design which offers multiple points of engagement and pathways for discovery. A chilling sense of unease accompanies Kudzanei Chiurai's post-modern rendition of the Last Supper morphing into a tableaux of violence, or Nandipha Mntambo's looped video of a lone bullfighter locked in a process of endless sublimation between public spectacle and private self, masculine and feminine, past and present. 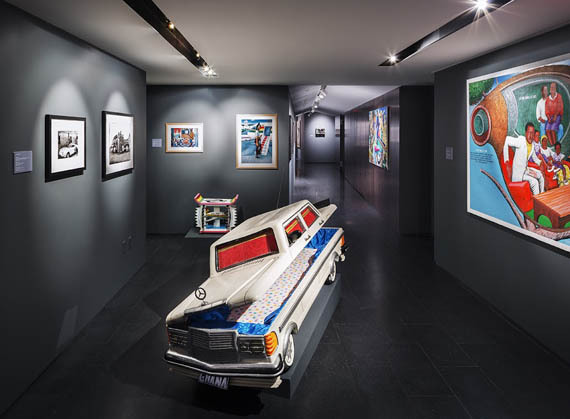 These challenging and historically laden contemporary moving image works are quickly diffused by the lighthearted humour inherent in exhibits such as Samuel Kane Kwei's elaboratively decorated Mercedes-shaped coffin-car, produced in the artist's family carpentry business in Ghana in the early 1990s. Image: Installation view, showing Mercedes (1993) by Samuel Kane Kwei in the centre. Photo by Dean Kaufman. J.D. 'Okhai Ojakere's portraits of extraordinary Nigerian hairstyles, organzsed in a large grid, again reveal a distinctive architectural sensibility, that echo in their taxonomy the industrial buildings projects of German artist duo Bernd and Hilla Becher. The final room dominated by a series of intricate drawings by Abu Bakarr Mansaray threatened to envelop the visitor in disturbing visions of a dystopian future, infused with a dark militarism and epic fantasy - only to be rescued by the sheer scale and fun of Titos Mabota's colossal bicycle sculpture installed at the far end of the gallery. Image: Installation view, showing Titos Mabota, Rural Bicycle (1998) and Abu Bakarr Mansaray, Sinister Project (2006). Photo by Renée Mussai. At times, one is overcome by the multiplicity of themes and genres on display: the sense of 'everything and nothing' that inevitably accompanies the bricolage of curating out of large, mixed media collections, and the feeling of dislocation that ensues. The curators' decision to adopt the theme of the African city as the over-arching narrative served as a useful means for the difficult task of extracting multi-faceted cultural meaning from the pantomime of pre and post-colonial history: the tension created between exuberant articulations of urban city life, the formation of new subjectivities and performative selves, somber reflections on violence, destruction and death, apocalyptic visions of state surveillance and civil chaos, utopian fantasies and sharp environmental critique - all mediated via the many transitory spaces between the private and the public. Encompassing five decades of drawing, installation, photography, painting, video and sculpture in Africa, Luminós/C/ity.Ordinary Joy was a triumphant and bold inaugural offering from a distinctive gallery space that promises to its local community - both inside and outside the academy - many transformative encounters to come. 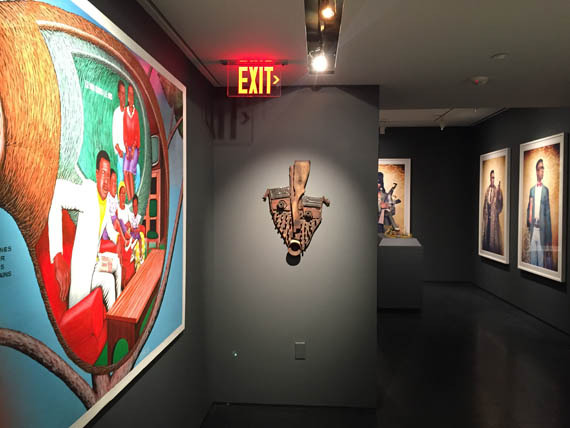 Luminós/C/ity.Ordinary Joy: From the Pigozzi Contemporary African Art Collection was on display at the Hutchins Center's Ethelbert Cooper Gallery of African and African American Art, Harvard University, Cambridge, Mass., between 21 September 2014 - 8 January 2015. The accompanying catalogue (edited by Vera Grant and featuring 97 image plates and several contextual essays) is available from the Cooper Gallery, and Harvard University Press.